(3)Do not use for AMD CPU. (4)Only use for HALF MINI PCI-E interface, Do not use for NGFF interface. 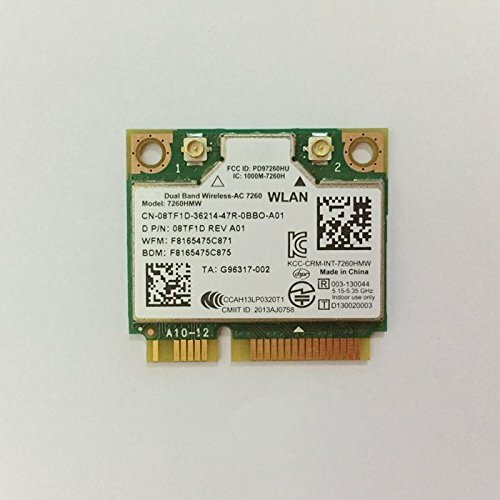 The Dual Band Wireless-AC 7260 802.11ac, dual band, 2x2 Wi-Fi + Bluetooth adapter lets you move at the speed of life with faster speeds (up to 867 Mbps1), higher capacity, broader coverage and longer battery life. Dual mode Bluetooth 4.0* connects to the newest low energy Bluetooth products as well as your familiar devices, such as headsets, keyboard, mice and more. Please know that this card is the universal version, it will work on all the laptops except Thinkpad/ Lenovo / IBM and HP For half size mini pci-e slot, Not use for IBM Lenovo Thinkpad and HP machines and AMD Motherboard. Supported Operating Systems: Win7, Win8, Win8.1, Linux, Supported NUC. Delivers dramatically faster Wi-Fi speeds (up to 867 Mbps1) than 802.11n, with more bandwidth per stream 433 Mbps), more capacity for more users (extended channel bonding 80MHz), broader coverage and better battery life (more data transmit efficiencies reduce power consumption). Only use for HALF MINI PCI-E interface, Do not use for NGFF interface.